From a childhood survivor of the Camdodian genocide under the regime of Pol Pot, this is a riveting narrative of war crimes and desperate actions, the unnerving strength of a small girl and her family, and their triumph of spirit--now a Netflix film by Angelina Jolie. 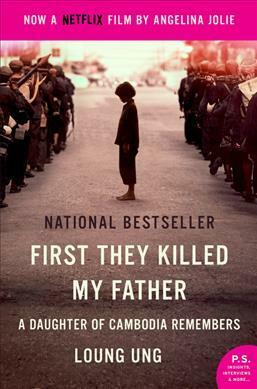 Repackaged in a new tie-in edition to coincide with the Netflix film produced and directed by Angelina Jolie, a moving story of war crimes and desperate actions, the unnerving strength of a small girl and her triumphant spirit as she survived the Cambodian genocide under Pol Pot's brutal regime. Until the age of five, Loung Ung lived in Phnom Penh, one of seven children of a high-ranking government official. She was a precocious child who loved the open city markets, fried crickets, chicken fights, and sassing her parents. While her beautiful mother worried that Loung was a troublemaker--that she stomped around like a thirsty cow--her beloved father knew Loung was a clever girl. When Pol Pot's Khmer Rouge army stormed into Phnom Penh in April 1975, Ung's family fled their home and moved from village to village to hide their identity, their education, their former life of privilege. Eventually, the family dispersed in order to survive. Loung trained as a child soldier in a work camp for orphans, while other siblings were sent to labor camps. As the Vietnamese penetrated Cambodia, destroying the Khmer Rouge, Loung and her surviving siblings were slowly reunited. Bolstered by the shocking bravery of one brother, the courage and sacrifices of the rest of her family--and sustained by her sister's gentle kindness amid brutality--Loung forged on to create for herself a courageous new life. Harrowing yet hopeful, insightful and compelling, this story is truly unforgettable. A moving story of war crimes and desperate actions, the unnerving strength of a small girl, and her triumphant spirit as she survived the Cambodian genocide under Pol Pot's brutal regime--NOW A NETFLIX FILM BY ANGELINA JOLIE. Until the age of five, Loung Ung lived in Phnom Penh, one of seven children of a high-ranking government official. She was a precocious child who loved the open city markets, fried crickets, chicken fights, and sassing her parents. While her beautiful mother worried that Loung was a troublemaker her beloved father knew Loung was a clever girl. Bolstered by the shocking bravery of one brother, the courage and sacrifices of the rest of her family--and sustained by her sister's gentle kindness amid brutality--Loung forged on to create for herself a bold new life. Harrowing yet hopeful, insightful and compelling, this story is truly unforgettable.